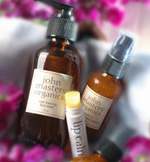 The John Masters range of products has long been a leader in the organic hair care market. Though a little biased (only because I adore using his products) I think the New York hairdresser has hit the nail on the eco organic head when it comes to his hair care range; they work like no other organic or non organic products this beauty blogger's tried. 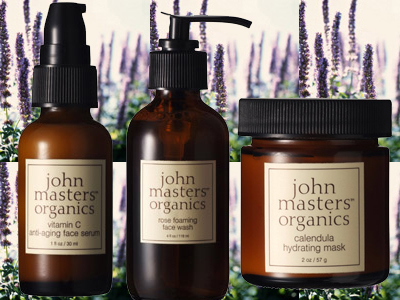 But, with the launch of the John Masters Skin Care Range, the question is: can he do it, naturally, for skin also? The team at John Masters have sourced some interesting organic ingredients (like linen, radish root and rye extract), used innovative ideas (a toner for face and hair) and drawn inspirations from all over the world to create this new line. The range is characterised by subtle natural fragrances and organic formulations with active ingredients to make these product a luxury for the skin but also truly work effectively. The line is one of the first to use two innovative natural preservatives: radish root extract and aspen bark extract. These act as all-natural anti-microbials to help these products stay effective for longer (an issue for many chemical-free brands). Many products in the line possess the USDA logo (the US organic certification body like the Soil Association), and all the ingredients are either organic or approved by EcoCert (the EU body that examines the environmental-friendly attributes of raw materials). So does John Masters expertise in organics transfer from hair care to skin care? You betcha - superior quality matched only by some of the other premium organic brands in the industry and his own hair care range.